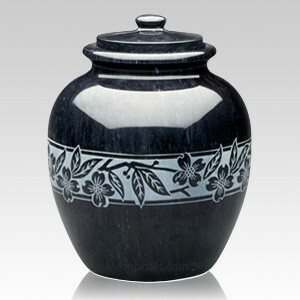 The Dogwood Marble Cremation Urn is made of natural quarried black marble etched with a dogwood design hand turned on a lathe and polished. "This is a beautiful urn and it was well worth the wait. There was some difficulty in getting it from the artist, but the customer service folks could not have been more accommodating. They went out of their way to make sure the situation was handled in a way that made me comfortable. I truly appreciate their efforts. I would definitely recommend Memorials.com."